There’s a lot of interesting facets to former Harry Potter actor Daniel Radcliffe. Case in point, he recently popped up on The Tonight Show with Jimmy Fallon, revealing his penchant for memorizing really difficult rap lyrics. Watch him giving Blackalicious’ “Alphabet Aerobics” a go, below. In the video, Fallon learns that Radcliffe is super invested in music, which is just his kind of guest. When asked specifically about his love of rap music, Radcliffe says it “surprises a lot of people.” He also says he has also really likes to learn the more difficult songs in the genre. 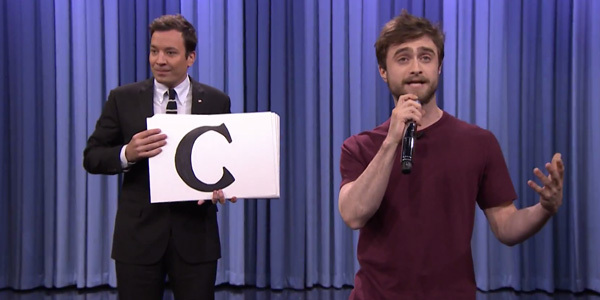 That apparently includes Blackalicious’ “Alphabet Aerobics.” After Fallon pulls a mike out from behind his desk, Radcliffe seems cool with giving the song a go, pulling off his blazer and getting his game face on. His rendition is pretty fair, and to his credit, he doesn’t get purple faced while spitting out the song, even when the tempo picks up halfway through. Just look at his cool, calm and collected face. Towards the end, he gets a little more unintelligible, but the original song is quick enough that the words smear together a little, too. Plus, the performance is impressive enough that the audience stands up to give the actor a holler. Radcliffe has a lot of random interests he gets excited about. He’s also stated he’s into American Football, and in this interview with Fallon, he mentions liking WWE, as well. The one thing he’s definitely not interested in is playing Harry Potter ever again, but if that means we get more weird appearances in projects like Horns and A Young Doctor’s Notebook, we’ll take it.